How was your weekend? Hope you had a lovely weekend. What's the weather like in the country that you reside? Here in England, the weather is pretty cold and it's getting dark very early in the evening. By 5pm, everywhere is dark, so we have to maximise our day time to get a lot of things done. This week's post is an opportunity for us to reflect on the life that we are living and to ask ourselves whether the life that we are living is meaningful and purposeful or whether we are getting carried away with vain things of life. Their lives were sold out to Christ. As a family, they travelled to a new country once a year to preach the gospel and to share bibles; they believed in financing the gospel. They did not take any decisions without being directed by the Holy Spirit. They taught all their children the importance of knowing the Lord and building a relationship with the Holy Spirit from a young age. They were both givers, they helped the poor in every country they visited. Despite being professionals in their respective careers, they had no cars or their own house during their life time on earth. They believed in building treasures in heaven and they shared the view that the most important inheritance to leave for their children was for them to know and live for Christ. When Papa and Mama Petéru died, all the people they had blessed around the world were sad to find out about their death. After their death, both their children and grandchildren were blessed with numerous material gifts ranging from brand new houses, cars, cash gifts, investment opportunities, life time savings. Above all, beautiful things were said about the rich lives that Papa and Mama Petéru lived for Christ and how their characters and their lifestyles drew people to the Lord. 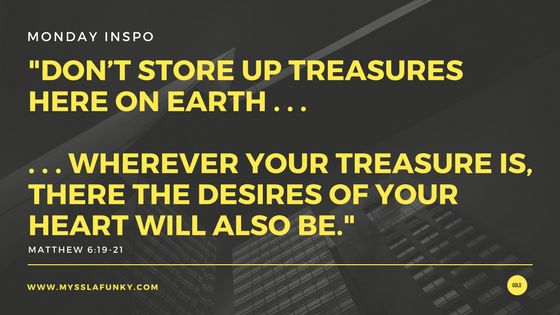 Jesus said in the book of Matthew 6:19-21 that we should not store up treasures here on earth where they can erode away or may be stolen. God advised us to store our treasures in heaven where they will never lose their value and are safe from thieves and if our profits are in heaven, our heart will be there too. What kind of life are you living? Are you fixated by earthly and material riches and gains? What legacy are you going to live behind? Think on this throughout this week. See you next Monday for another post. Actually, see you tomorrow as we have a question that I would like to know your views about it. Dilemma! Dilemma! What would you advise Jemimah?